Christmas 1971 "I gave Marty a sewing machine and she gave me a trophy case for my small mementoes-silver and gold footballs, rings and things that a ballplayer accumulates and likes to display in a tasteful way. She also gave me, in her usual thoughtful way, a glass painting of the chapel at Duke. It's beautiful, and so was the idea. ""With that trophy case I get a chance to show off my Super Bowl ring-from the game we won. Better than that, I can display my Duke graduation ring. I can't wear either of the rings because I can't get them over my finger...I'll be glad to place that Duke class ring in a trophy case. I'm more proud of that than I am of my Super Bowl ring. I had to work a lot harder for the one from Duke"
1962 Season: Duke goes undefeated in ACC play at 6-0 to capture league title. Year ends with a 16-14 victory over North Carolina to finish with an overall 8-2 ledger. 1963: Duke defense picks off a school record 6 passes in a 39-7 victory over Wake Forrest. In the fifty-two years between 1940 - 1992 six 1st-Round Draft Picks came from Duke. 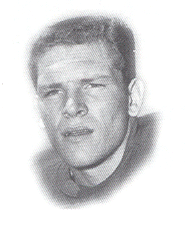 In 1965 Mike Curtis was Duke's only 1st-round draft pick going to the Colts. Mike's first year shoes at Duke - notice the #28 - Mike's later Duke shoes in the picture to the right. Mike wore #33 while at Duke.